This two-piece suit is ideal for any rider on a limited budget who likes to ride on the street and do the occasional trackday. Instead of shelling out a lot of money for a one piece suit that you’d normally wear only a few times a year, you can go with the versatility afforded to you with a two-piece leather suit like the Octane from Alpinestars. With the Octane 2-piece suit, you can ride wearing only the jacket when going about your normal week-in, week-out business yet, you’ll have a full suit at the ready when it’s time to go scratching on the weekends. This is perfect for the trackday rider and at $345 shipped anywhere in the lower 48 states, these suits are on sale at HALF OFF RETAIL PRICE. Find out more about our Alpinestars sale forum special and check out photos of this suit by clicking here. If you’ve ever been reluctant towards buying a set of leathers, getting an Octane 2-piece suit is like buying a leather jacket with a set of riding pants thrown in for free! 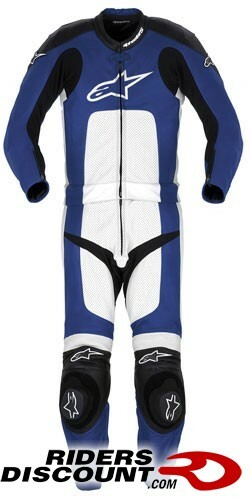 Our Alpinestars expert TJ can help you get sized correctly for this leather suit. Call him at 866.931.6644 ext 817 while supplies last! Sale is good while supplies last. We've already sold out of white/silver 44 suits!